How to approach listening to the world’s longest album, clocking in at over thirty hours of music, hundreds of pages of sleeve notes and extensive video footage all packed onto an SD card that has to be plugged in a USB stick and accompanied by a small booklet covered with the picture of a burning church? Ideally all in one sitting. If that’s not possible, try seven approximately four-hour shifts. Certainly you’ll need enough time to get into a contemplative listening space, for however long you’re able to maintain it. 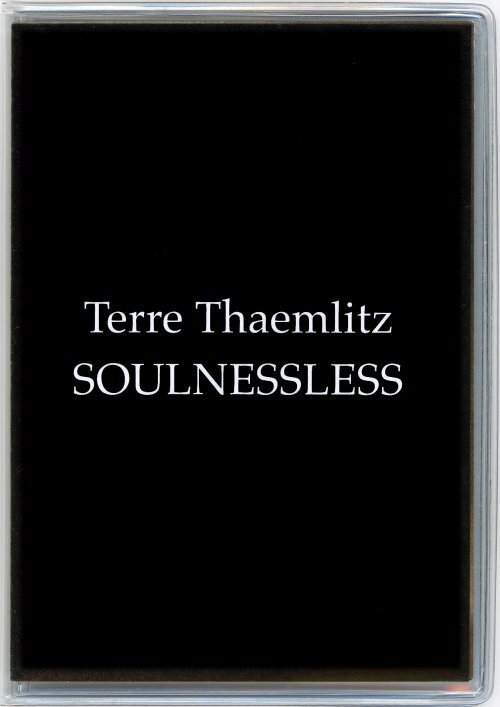 As the album title indicates and the copious notes explain in great detail, Soulnessless is not an invitation to share in any kind of religious experience—even if the way its fifth Canto unfolds over twenty-nine-plus hours approximates a form of devotional music. Instead, the album is a journey into the metaphysical depths of the anti-religious experience—the destructive and superstitious nature of all forms of spirituality, approached from a variety of musical and critical perspectives. The unifying thread here is Thaemlitz’s tightly wound autobiographical and artistic relationship to the disparate themes of gender transitioning, Japanese immigration law and Catholicism. This is the general framework laid out by the first four “Cantos”, incorporating video films that contextualize the music both visually and discursively, with large portions of the sleeve notes displayed on screen and offering their own engaging narrative. Taken together, the first four Cantos function as a kind of deconstruction of gender and religious upbringing in the form of Thaemlitz’s odyssey across Japan, the United States and the Philippines. Field recordings of Filipino nuns interviewed about their convent’s electronic sound system, conversations with workers seeking a better life, legal or otherwise, in Japan, are cut-up and recombined with the sound of clicking rosary beads, vinyl crackle, digital distortion, American religious AM radio, Hank Williams and papal mass. The appropriation of resurrection classic ‘I’ll Have a New Body (I’ll Have a New Life)’ at the end of ‘Canto I’ is a particularly striking example of Thaemlitz’s plunderphonic expertise: played almost in its entirety and panned hard left (and low?) in the stereo field, you have the impression of hearing the song for the first time. But ‘Cantos I – IV’ make up less than 1/30th of the album’s duration, the bulk of which is the twenty-nine hour ‘Canto V – Meditation on Wage Labor and the Death of the Album’. The “meditation” is almost entirely based on a series of slow-moving chord modulations played on a grand piano, with each new chord played only after the previous one has reached the end of its sustain. Its duration alone makes it a unique listening experience. What remains of the abusive Catholic brainwashing I endured in early childhood won’t let me lie that I listened to it in one sitting. It involved long stretches of contemplative listening, interspersed with “lost” periods drifting between sleeping and waking. And just in case I missed some monumental musical shift during one of those drifting moments, I returned at least four times to the last hour of ‘Canto V’, and I also randomly dropped in and out for extended periods elsewhere across the length of the MP3. By now I was coming back for more because I was enjoying it — not because I felt duty-bound to do so. Certainly, the somber, repetitive nature and literal “hammering” away of the chords on the piano conjure up images of factory labor, and in that sense, ‘Canto V – Meditation on Wage Labor and the Death of the Album’ justifies Thaemlitz’s claim for it being an act of resistance to the digital world’s filesharers whose belief that all music should be free has made the musician/composer’s labor worth next to nothing. This brings up an interesting point about the conceptual and political implications of not only this album but also instrumental music in general. In the June 2012 issue of The Wire, Jan Jelinek claimed that the “meaning” of instrumental music should only be understood in the context in which it’s heard, and any conceptual value added by titles or notes accompanying it shouldn’t be conflated with the pure listening experience. Well, nobody can force listeners to take on board the thoughts or feelings shaping the work, even when text may indicate how the artist wants it to be heard. But Soulnessless is more than just music. It was conceived as a Gesamtkunstwerk—one which can only be fully experienced as a complex interplay of autobiographical and activist texts, composed and found music, and still and moving images. Chris Bohn is a longtime editor of British avant-garde music magazine The Wire. For the last issue of Electronic Beats, he recommended Oren Ambarchi and Thomas Brinkmann’s The Mortimer Trap.